Can Ants Live Without Their Queen? As there are many different types of wasps, this article focuses on the yellowjacket, one of the most common types of wasp from the Vespidae family. The yellowjacket life cycle begins with a fertile queen, who builds a nest and uses stored sperm to create worker bees. These worker bees continue building the colony, and die off at the end of summer. The life cycle continues with newly-created queens hibernating through the winter to start the life cycle again the following spring. Each species of wasp has a slightly different life cycle. The difference lies mainly in the nest-building ritual, and how the new nests are started. Since there are many different types of wasps in North America, this article focuses on the life cycle of the most common wasp: the yellowjacket. Yellowjackets are social wasps, which means that they build large nests and create colonies of thousands. The yellowjacket life cycle begins when a fertilized female queen starts building a nest. She builds a rather small nest at first and lays eggs in it that hatch into female worker wasps. Once these worker wasps reach maturity, they continue the nest building process while the queen continues to lay eggs and hatch additional female workers. This allows the nest to grow rapidly with the constant introduction of new workers. Interestingly, the queen is able to continuously lay eggs without mating due to her ability to store sperm. After mating with a male in the autumn, she stores the sperm for later use when she builds her nest. She then uses the same sperm again and again to continuously lay eggs and quickly grow her colony. She usually runs out of stored sperm by the end of the Summer or early Fall, at which time she must find another male to mate with. The new males in the colony are developed from the unfertilized eggs the queen lays at the end of summer. Young males leave the colony to try to mate with new queen wasps, after which they usually die off. 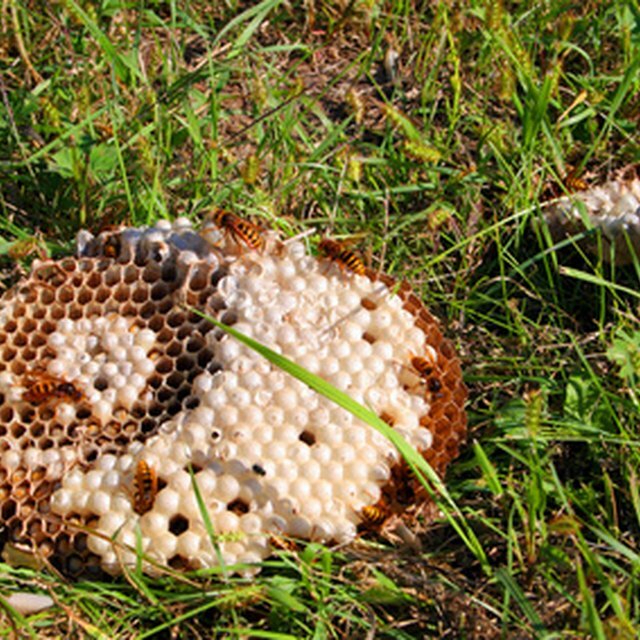 From late Summer to early Fall, all of the unmated female worker bees die off as well. Thus, the only member of the wasp colony who survives the winter is a mated female. The mated female will find a safe place to overwinter, and will remain dormant until Spring. Even though the queens survive the winter, they usually only live about one year, and the life cycle is continued by new queen wasps. There is a large difference in the life cycles of social wasps and solitary wasps. Solitary wasps typically build mud-like structures on the side of walls in which they lay a single egg. The eggs are then left to develop on their own, and are not tended to by adults like in the social wasp colonies. Male wasps do not have the ability to sting. The stinger and its venom is part of the reproductive organ of a female wasp, so only females have the ability to sting. Wasps are the most active (and therefore present the most danger to humans) during mid to late Summer. This is the time when the colony has grown strong, and young females are leaving to find new mates. Prevent wasps stings by avoiding barefoot walks in the grass during mid-late Summer. If a wasp lands on you, do not swat at it or try to squish it. If possible, grab a magazine or piece of paper and scoop it off you. If you are drinking from an open soda cup, check your drink before taking a sip. Wasps are very attracted to the sweetness of soda. Keep outdoor trash cans covered and empty them frequently. Otherwise, wasps might congregate around the rotting food. Different species of wasps exist across North America. The colonies are moving increasingly north, to places that rarely saw wasps a few decades ago. Environmentalists point to global warming and climate change as a reason the wasps are migrating north. Climates that may not have supported wasp colonies are now warmer and more inviting to the colonies for nesting. Typically though, wasps do not venture far away from their birthplace. 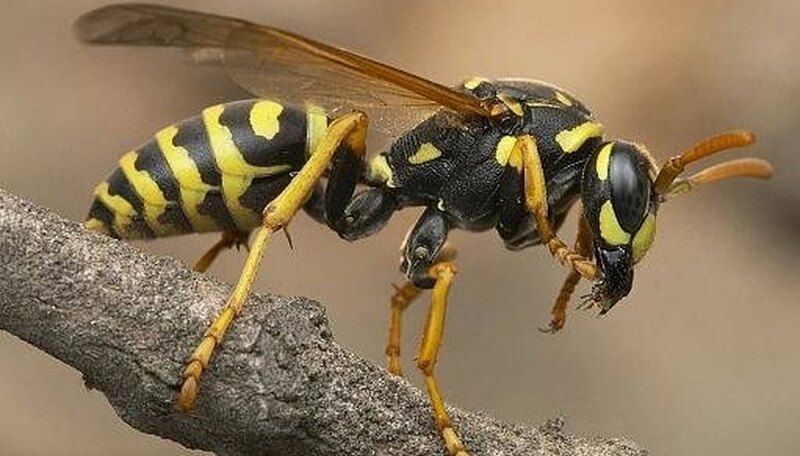 The most common type of wasp in the United States is the Vespidae family, which includes hornets, yellowjackets, pollen wasps, paper wasps, and potter wasps. Yelena Johnson is an avid writer and wedding planner based in Los Angeles. She is also the Creative Director and Lead Planner at The Stylish Soiree, a boutique and full-service wedding planning firm in Beverly Hills, California. Her articles have appeared in Hills & Lagoons magazine, Celebrations.com, Better Bridal magazine and Bridology, as well as her own blogs, The Stylish Soiree (stylishsoiree.wordpress.com) and Shopaholica (shopaholica.wordpress.com). Johnson, Yelena. "About the Wasp Life Cycle." Sciencing, https://sciencing.com/wasp-life-cycle-4565729.html. 24 April 2017.